Booking for our conference in Cambridge this coming July is now live on the Society’s web site (where you can download) a booking form. 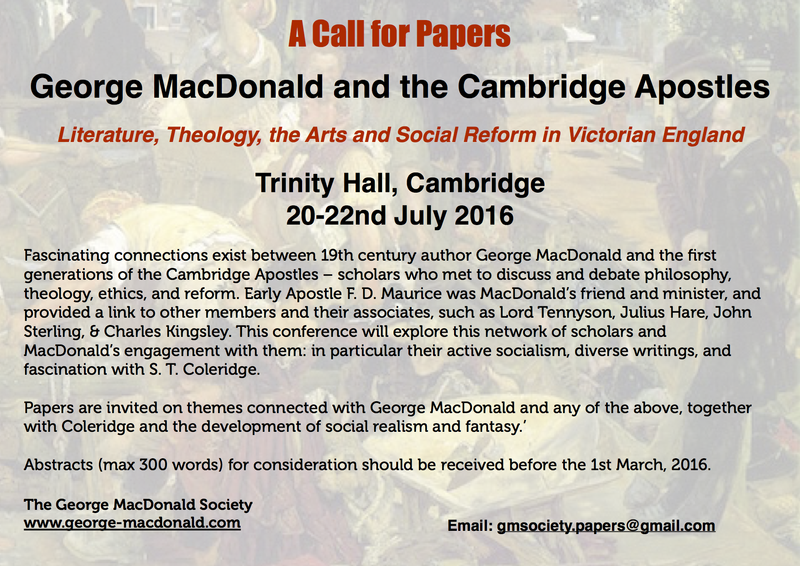 The Theme is George MacDonald and the Cambridge Apostles, which is very appropriate, since Trinity Hall was the college of F.D. Maurice, MacDonald’s mentor. Confirmed keynote speakers already include Stephen Prickett, Kerry Dearborn and Elizabeth Jay. If you have any queries please feel free to contact me. CALL FOR PAPERS (20 mins + questions) – the deadline is 1st March, though it would help with our planning to hear from you earlier. Proposals (including name and institutional affiliation, CV, title of the paper, and an abstract of no more than 300 words) should be sent to gmsociety.papers@gmail.com. Mike has been creating web pages and managing online communities since 1995. His web site www.george-macdonald.com is online home to the George MacDonald Society and he is also responsible for www.digital-disciple.com which provides material for the nurture and discipling of new Christians. He is active on Facebook and can also be found on Twitter as @mjpartridge. Apple and PC, literate he has a heart for discipleship and unlocking the truth of the Bible.